2010…New year, new start I think 🙂 Here are my resolutions or goals for the new year. Lets see i I can stick to them. Probably not. – see more of my friends and family – I love catch ups, but lately I have been struggling to find the time to extract myself from shifts at the shop, or piles of uni work, so this year I going to try harder to make time. – look after number 1 – Recently I’ve not been taking care of myself very well. I eat too much junk! So that will have to change. I want to cook from scratch more so that I know what I am eating, and generally eat more healthily. I also want to take more care of my skin, which will go hand in hand with healthy eating. – stop hoarding! – I keep EVERYTHING, and I keep trying to justify this, eg: “It will come in handy in my uni work” or “I’ll wear it one day”. It never comes in handy, and I never wear it, so I don’t know why I do it. I need to clear out the junk and de-clutter! Starting today! – make more of an effort at University – This year I’ve found myself slipping slightly, and not concentrating on the tasks in hand. I don’t seem to of been taking things seriously and I always leave things to the last minute. My work is nowhere near as good as it could be, so I’m going to try so much harder! – drive more – I have my lovely little car sat on my driveway, but bless it, it only sees my work car park. I need to use it more and go some place different in it. Road trip? Yes please. I wonder how long I will keep these up for? We shall see. BE SURE TO ENTER THE GIVEAWAY ON THE POST BELOW! Really nice outfit! It´s amazing! 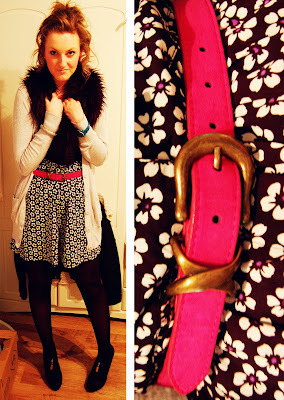 Nice outfit, I'm glad to finally find a blog where someone has clothes from reasonably priced british shops! those are great resolutions–especially the managing money and no hoarding one. i should really do those too ughhh.